A man with an unusual name has been accused of assaulting an Evergreen State College police officer and a Thurston County deputy. 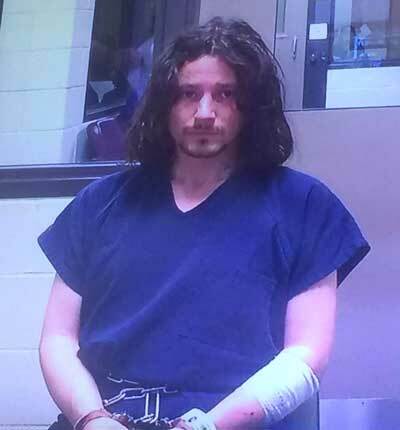 Beezow Doo-doo Zopittybop-bop-bop, 34, appeared in Thurston County Superior Court in Washington State on Monday on charges of first-degree assault (two counts), third-degree assault, third-degree malicious mischief and malicious harassment. Bail was set at $50,000 with an arraignment set for Feb. 16. Prosecutor Mark Thompson said he was unable to verify the suspect’s legal name and deferred to his original name, Jeffrey Drew Wilschke. The suspect said in court that he had legally changed his name to Beezow Doo-doo Zopittybop-bop-bop in 2011. Court documents said that an officer at The Evergreen State College responded to a report on Sunday afternoon that someone had torn down several fliers from the library entrance. The officer chased the suspect and eventually took him down to the ground, but the suspect thrashed around and tried to grab the officer’s gun. During the struggle, the suspect bit the officer’s ring finger several times and also tried to stab the officer with an ink pen. The officer was unable to control the suspect, who kept grabbing for his gun, and ended up stepping away. The suspect retrieved a handcuff case, then swung it like a hammer, causing a laceration on the officer’s head. The officer punched the suspect in the jaw, but the strike didn’t faze him. The officer then used a taser twice, causing the suspect to fall to the ground on the second taser deployment. However, the suspect got up and fled on foot. A Thurston County Sheriff’s Office deputy saw the suspect running along Evergreen Parkway and chased him into a wooded area. At one point, the suspect threw a rock at the deputy. The deputy used his taser on the suspect, who broke the electrical lines and kept running. The suspect again threw rocks at the officer, striking him at least once. The deputy caught up to the suspect and struck him several times with a metal baton. The deputy noted that the baton strikes didn’t have much of an effect on the suspect, who was able to grab a brick and throw it at the deputy before running off into the woods again. At this point, another deputy joined the pursuit and deployed a taser on the suspect. The suspect was eventually tackled, handcuffed and arrested. The Evergreen officer was transported to Providence St. Peter Hospital where he received a tetanus shot and four staples to close the laceration on his head. Zoppitybop-bop-bop also was transported to the hospital for a medical evaluation. It is unknown whether Zopittybop-bop-bop was under the influence of drugs at the time of his arrest Sunday. He has been listed as homeless, although the sheriff’s office confirmed he has a post office box registered in Olympia. In 2012, Zopittybop-bop-bop was arrested on marijuana and weapon charges in Wisconsin. He was also arrested in 2013 on drug charges in Iowa.